The Nicaragua Canal, a Life Long Dream of Nicaragua! The concept of a canal in Nicaragua has been going on for almost five centuries. The Spaniards first arrived in Central America in the XVIth century. 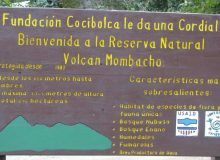 They soon discovered the vast Lake Cocibolca, or Nicaragua. They learned from the natives that it had a draining point at its south eastern corner. Immediately, they became enthralled with the idea of a route that would connect both oceans. Expeditions were sent to investigate. 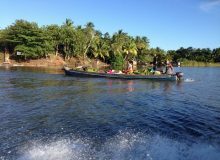 Soon they found that the San Juan River was navigable all the way between Lake Nicaragua and the Caribbean Sea. With Lake Nicaragua also being also navigable, they struggled, unsuccessfully, to find an outlet from the lake to the Pacific Ocean. The narrowest section between Lake Nicaragua and the Pacific Ocean is through the isthmus of Rivas, and is only about 12 miles wide. The pre-Colombian indigenous cultures knew of the river and its interconnection between both bodies of water. Yet, it was not until 1539, when under the command of captains Calero and Machuca, that the route was officially “discovered”. The above mentioned Spaniards led an expedition down Lake Nicaragua to the Caribbean Coast. This opened a trading route, that permitted trade between Granada and the rest of the Caribbean Spanish colonies. 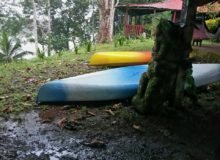 It turns out that Lake Nicaragua, which has an altitude of 31 meters (about 100 feet) above sea level, drains out towards the Caribbean Sea through the San Juan River. The river takes almost 200 km (120 miles) to reach the sea, which means that the flow of water is gentle and steady due to the very small gradient between both bodies of water. Furthermore, the steady flow of water is ensured, due to the huge body of water that forms the lake, avoiding the need of building dams, and practically eliminating the need for locks to raise or lower vessels during their transit. Cornelius Vanderbilt officially created the transit route as a commercial shipping route to transfer the individuals that were attracted to the West Coast of the USA during the California Gold Rush. In the days before the transcontinental railroad was finished in the USA, connecting the Pacific Coast to the rest of the USA, it was cheaper, faster and safer to use the transit route which involved travelling from New York or New Orleans to the Caribbean port of Greytown, at the mouth of the San Juan River, and then on a steamboat up the San Juan River to Lake Nicaragua, across the lake to the port of La Virgen, on the Western shores of the lake, and then over land the 12 or so miles to the port of San Juan del Sur, where they would board their steamships north towards California. 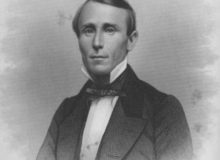 In order to establish and truly control this lucrative commercial route, Vanderbilt commissioned William Walker to look after his interests in Nicaragua. Walker became an important part of Nicaraguan history when he overthrew the Nicaraguan president, and proclaimed himself President of Nicaragua. Once in control, he decided to take possession of the transit route, and therefore lost the support of Vanderbilt. The Central American states, saw Walker as a threat to their own security. Thus, they decided to help Nicaragua get rid of Walker. By invading the country, they forced Walker to flee Nicaragua. He was eventually captured and put before a firing squad in Trujillo, on the Caribbean Coast of Honduras. 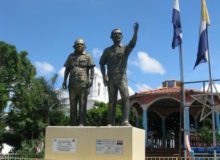 During this period of time, Costa Rica, who had seized the southern province of Guanacaste from Nicaragua during the war against Walker, demanded that Nicaragua cede the territory to them as payment for their efforts to help them expel Walker. Nicaragua was not in a position to go to war with Costa Rica after having been devastated by the civil war against Walker, and was forced to give in, signing a treaty that has been called the Jerez Cañas Treaty. Under this treaty, which was signed on the 15th of April, 1858, Nicaragua renounced its rights to the province of Guanacaste; however, in exchange, received a few benefits. First, it ensures that its border with Costa Rica is pushed a few miles from the shores of Lake Nicaragua. By doing so, it retains complete sovereignty over the Lake. It was also agreed upon that the border that was marked by the San Juan River was acknowledged by Costa Rica as being “their” side of the river, and not the river itself; by achieving this, Nicaragua has complete control of the river, since the river is completely within its border! Furthermore, the treaty states that Nicaragua has the right to build any infrastructure on both sides of the river should it decide to build a canal in the future. As can be seen, Don Maximo Jerez, who represented Nicaragua in the signing of the treaty, was a man of vision, and should (in my personal opinion) be considered a national hero in Nicaragua! Costa Rica has tried to renege on this treaty a couple of times, the first important effort was in 1888 when both countries requested that the president of the USA, Grover Cleveland hand an arbitral award regarding the disputes. On this occasion, President Cleveland upheld the treaty that had been signed by Jerez and Cañas in 1958, officially putting end to a 30 year dispute by Costa Rica. 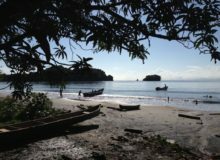 More recently, Costa Rica sued Nicaragua in the international court at Le Hague arguing that its rights were being hampered when Nicaragua would not allow armed Costa Rican police to patrol the River. In a historic sentence, the court declared that Nicaragua had exclusive sovereignty over the river and confirmed Nicaragua the rights it acquired when they signed the treaty in 1858! Such being the case, Nicaragua happens to be sitting on a truly privileged geographic location, with an almost perfect setting to build a true inter-oceanic Nicaragua canal that would probably only need locks on the section between Lake Nicaragua and the Pacific Ocean. After the court at The Hague ratified Nicaragua’s control over the San Juan River, the government of Nicaragua, led by President Daniel Ortega has officially set out to look for international investors that would be interested in a partnership with the government of Nicaragua to build such a canal. It is evident that such an investment would not only be a good business, but also a tremendous boost to the Nicaraguan economy. 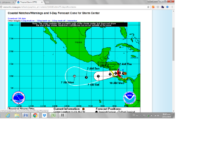 Hurricane Otto update for Thursday, November 24th. Tropical storm conditions expected any minute along the Caribbean Coast of Nicaragua and Costa Rica. Hurrican Otto, a unique and rare meteorology event is about to unfold along the Caribbean Coast of Costa Rica and Nicaragua. In over 150 years of records, there has never been a Hurricane to make a direct hit in this area. Few Nicaraguans have ever been to the Caribbean Coast. Thus, have no real clue of what the reality is there. I decided to go out exploring the Caribbean Coast of Nicaragua and see for myself what it is all about. Tales of Sandino took epic proportions after his death. These tales served as inspiration in the revolt against Somoza. The Rama Indians are a small ethnic group that lives in a territory between the Bay of Bluefields and the San Juan River. Most live in Rama Cay. The National Park System has several different titles to the areas, depending on the specific protected status, and includes Biosphere Reserves.